The 2019 Harley-Davidson® Tri Glide® Ultra is for sale at Latus Motors Harley-Davidson®. Find our local dealership near Salem, Oregon and explore this new Harley-Davidson® Trike in person. Our Harley® sales team is waiting to showcase the safety systems, warranty benefits, and standard features. Complete our secure online credit application and start the process of being pre-approved for a motorcycle loan. Experience the solid stance, soul-satisfying rumble, and crisp throttle response of a Harley-Davidson® Trike today. Take the short ride from Portland to our new and used motorcycle dealership to explore the full line of 2019 motorcycles for sale. This 2019 Harley-Davidson® Trike has a Twin-Cooled Milwaukee-Eight 114 V-Twin engine. Twist the throttle and unleash 114 cubic inches of horizon-chasing power and 121 pound-foot of torque to the rear wheels. This is premium touring at its finest. 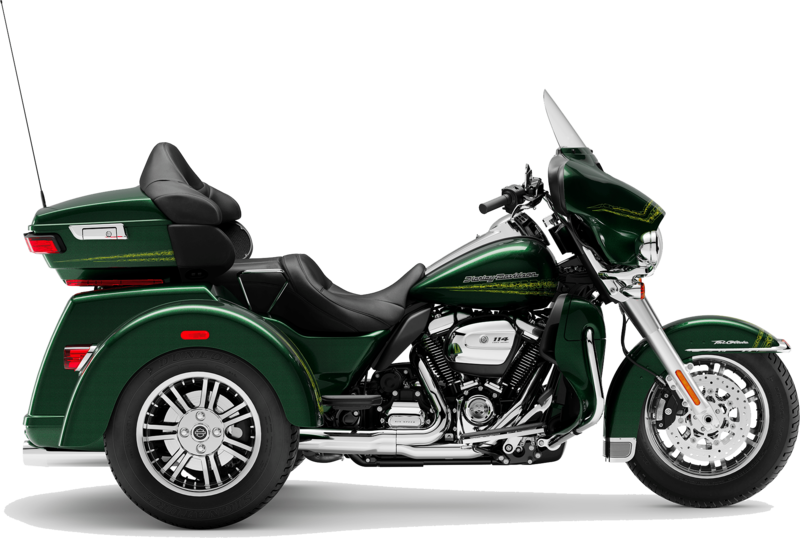 If you are planning to make the trip to the Sturgis Motorcycle Rally this year, this Trike will transport you in style and comfort. On this new Trike, riders can customize the soundtrack of their ride with a premium BOOM!™ Box GTS Infotainment System. Stay connected to your smart devices, your bike, and your road. For longer cruises, give your wrist a rest and set the electronic cruise control on the 6-speed Cruise Drive Transmission. If you're concerned about space for your riding essentials, the 2019 Tri Glide® Ultra boasts 4.4 cubic-feet of storage capacity. When you need new parts for your Harley® or want to shop for genuine Harley-Davidson® riding gear, our parts and accessories department has you covered. We carry a vast selection riding gear, jackets, helmets and more. Visit our showroom to enjoy the full line of 2019 Harley-Davidson® Trikes for sale. How many wheels does it take to get to the center of your next adventure? Seat Height, Laden 7 27.1 in.